Stoneware, handpainted raised relief decoration with gold relief accents. 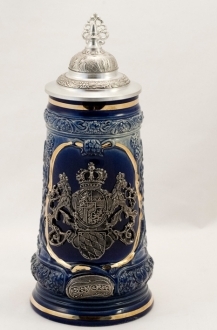 This stein prominently features the German Eagle against a midnight blue background with white snowlike highlights. 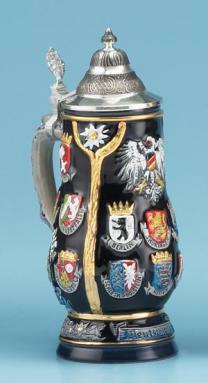 All 16 Regional Coats of Arms are displayed below, to the left and to the right of the eagle. 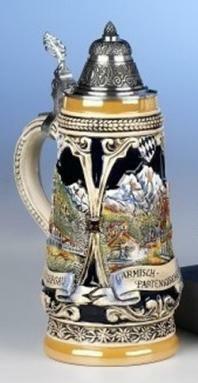 Deutschland is etched into a raised ribbon near the bottom. 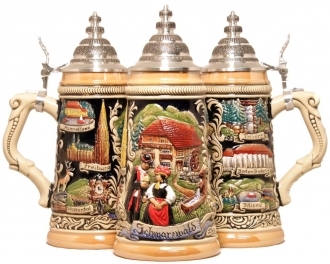 The unusual pear-shaped stein body and the pedestal base combine to create a very attractive body design. 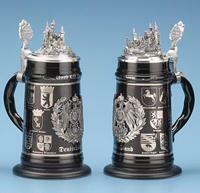 An ornamental pewter lid completes the piece.